Stop stressing over an unexpected gas or electric range repair in Marlboro, New Jersey, and turn to our company for an expert service. Without a doubt, your range is a worthwhile investment. With this kitchen appliance, you can prepare delicious home-made meals whenever you want to. Anyway, it will be quite hard to do so when issues start popping up. If this is the case, we recommend you to stop using the appliance in an instant and call us to book an appointment. Wherever you are in the area, we can dispatch a trusted range repair Marlboro pro to assist you that very day. By being highly qualified to work on most major brands, the tech will bring your unit back to normal in a flash! 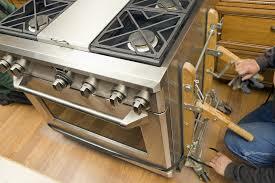 It’s obvious that it’s never a good time for oven range repair. Nowadays, people heavily depend on their cooking units and so failures create all sorts of problems. Luckily, you can distance yourself from such troublesome situations by booking thorough maintenance check-ups with our company. Once or twice a year, a skilled expert will perform a full diagnosis on your appliance and take the steps needed to fix all tiny issues right on site. Entrusting your range repair in Marlboro to us is the easiest way to keep your appliance in top operative order for years to come! Feel safe when using the range by calling us now for service.